• Enhances the function of liver and kidney. 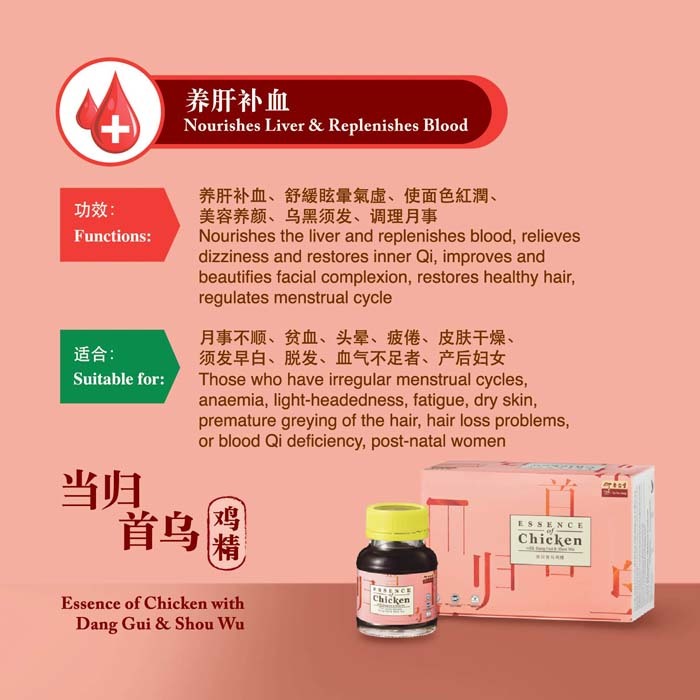 Eu Yan Sang Essence of Chicken with Dang Gui and Show Wu is extracted from selected fresh premium graded chicken infused with the essence of traditional Chinese herbs Dang Gui and Shou Wu, using a signature combination of traditional methods and state-of-the-art technology. This product is suitable for ladies who experience menstrual cramps and mild anaemia. • Dang Gui enriches blood and also boosts vitality, promoting blood circulation and helps in regulating the menstrual cycle. Show Wu enhances the function of liver and kidney. The combinations of these two traditional Chinese herbs help in enriching blood, nourishing Yin and also combat ageing symptoms. For adolescent and adult, take one bottle each time.